The concept of an urban edge suggests a hard line, a point at which a city turns into something else. In a place like Vancouver, surrounded by edges of all kinds, these lines are very permeable; urban becomes industrial becomes altered landscapes becomes stands of trees – and water is everywhere. Areas that were once woodlands now contain industry or homes. Industry moves out and nature reclaims the land, and many of these types of environments contain remnants of each stage in the evolution of the city and its surroundings. 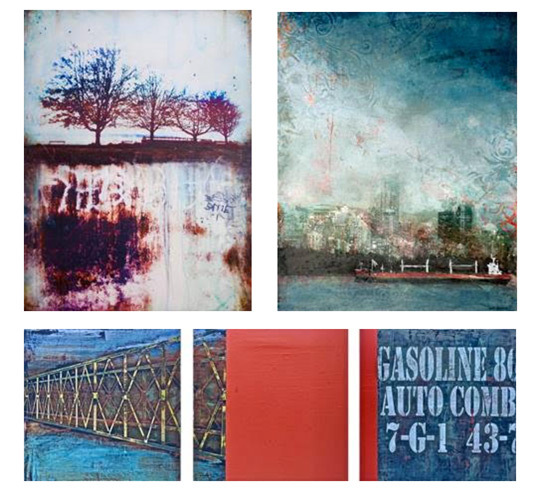 In this exhibition of painting and multi-media works, artists Lori Bagneres, Joy Munt and Barb Pearson delve into the industrial activities and remnants, modified landscapes, and waterway edges that exist on the fringes of the urban environment around Vancouver. These areas can be post-industrial and seemingly abandoned, but alternatively, can express a vibrant zone between the man-made and the natural geography and landscape, and are frequently overlaid with the markings and signs of human culture that surround us. Lori Bagneres looks to the interconnectedness of spaces that humans share with the environment. Images of serene landscapes converse with an edgy, cultural world. Joy Munts’ work features landscapes that are intertwined with a world of construction, stasis and deterioration. Barb Pearson explores the geography of the city and its’ waterways while contrasting the elements of the contemplative with the rawness that lies beneath the surface. What underpins the work of these artists is an inquiry into the dynamics of urbanism and how this can be expressed in a work of art. Although each approaches the subject in a unique way, these artists create works that bring forward the essence of place, and provide us with images that brings to light these often overlooked and under appreciated parts of the City.